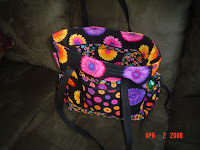 This is the "professional tote" I made at the Spring Quilt Retreat in Grantsburg during March 27-30th. It took me a couple of days to make, along with the help from a dear friend, Jan B. My copy of the pattern directions was a little confusing, so it was nice to have someone who teaches the class there to guide me along! Thanks Jan! Quilt retreat is a nice way to complete sewing/quilting projects, get inspired by other's projects, make new friends, renew old friendships, and just relax and enjoy the comaraderie of other quilters.